Funeral Etiquette & Who Buys Casket Flowers? 1 Funeral Etiquette & Who Buys Casket Flowers? When individuals visit a loved one's grave, they often want to bring flowers. When doing so, they must not only respect the policies of the cemetery, but it is also proper graveside etiquette to consider the buried person's religious beliefs and respect those buried beside them. Military cemeteries, for example, have different requirements than civilian. Understanding the policies and following proper etiquette will ensure your flowers are not taken down and that your flowers are enjoyed by all. During holidays, such as Memorial Day, people want to visit both military and civilian graves to leave flowers. According to Arlington National Cemetery, it is appropriate etiquette to leave fresh-cut flowers rather than wreaths at the gravesides. The only time it is proper etiquette to leave a wreath is during the Christmas holiday. It is acceptable to leave fresh-cut flowers throughout the year; however, artificial flowers are allowed from October through April to prevent frost. Potted plants are allowed at military gravesides 10 days before and after Easter, as well. Attendants remove dying flowers automatically so as not to tarnish the appearance of gravesides. Most cemeteries utilize floral tins placed by each grave on the ground. Loved ones can place flowers and adornments in these tins during each visit. Tins should remain by each graveside and you should never remove a tin from another’s graveside to add more flowers. In the event that the cemetery does not provide floral tins, it is proper etiquette to bring floral arrangements in nonbreakable containers -- avoid glass or terra-cotta. Respect a person's religion even after death. 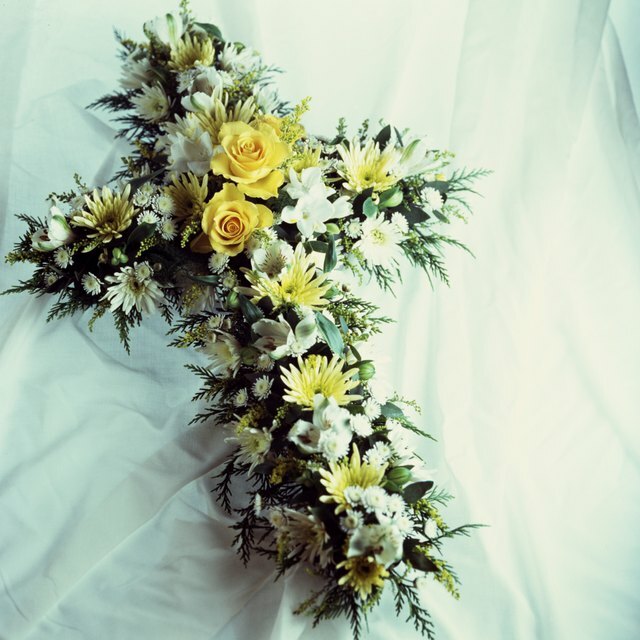 Consider the flowers that represent that individual’s religion when placing flowers at the graveside, or whether that person's religion allows the use of flowers. Eastern Orthodox, for example, uses white flowers at gravesides. Judaism prefers the use of fresh fruits rather than flowers; therefore, placing flowers at the graveside may not be appropriate, depending on how traditional the person's values were. Some cemeteries have a specific list of restrictions to abide by when placing flowers at a graveside. Contact the groundskeeper or an official at the cemetery to find out what flowers you can use at the gravesides, how large the flower arrangements can be and any other special restrictions. This will prevent any violations of policies for the cemetery, but also ensure that someone does not remove your flowers for being inappropriate.